Wisdom Energy is a simple and compelling introduction to Buddhism by two Tibetan lamas renowned for their insight and skill in teaching Westerners. Containing an entire meditation course, it goes to the heart of basic Buddhist practice and discusses the meaning and purpose of meditation, the causes of dissatisfaction and unhappiness, and the methods for subduing them and gaining control over our minds and lives. Originally published in 1976, Wisdom Energy still preserves the power, humor, and directness of the lamas's first teaching tour of North America, giving the reader the feeling of an intimate audience with two highly respected teachers. 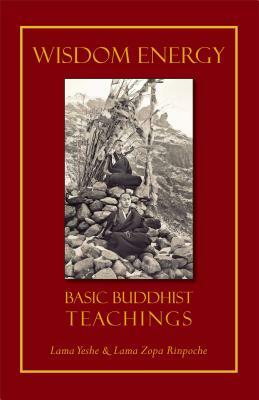 Lama Thubten Yeshe (1935-1984) was born in Tibet and educated at the great Sera Monastic University. He fled the Chinese oppression in 1959 and in the late 1960s, with his chief disciple, Lama Thubten Zopa Rinpoche, began teaching Buddhism to Westerners at their Kopan Monastery, Kathmandu, Nepal. In 1975 they founded the international Buddhist organization, the Foundation for the Preservation of the Mahayana Tradition (FPMT), which now has more than 160 centers, projects and services worldwide. Lama Thubten Zopa Rinpoche is the Spiritual Director of the Foundation for the Preservation of the Mahayana Tradition (FPMT), a worldwide network of Buddhist centers, monasteries, and affiliated projects, including Wisdom Publications. Rinpoche was born in 1946 in the village of Thami in the Solo Khumbu region of Nepal near Mount Everest. His books include Transforming Problems into Happiness, How to Be Happy, and Ultimate Healing. He lives in Aptos, California. Jonathan Landaw was born in New Jersey and has traveled the world since 1970. He spent six years living in northern India studying Tibetan Buddhism and is the editor and author of a number of Buddhist books, including Wisdom Energy, Introduction to Tantra, and Buddhism for Dummies. He lives in Santa Cruz, California.